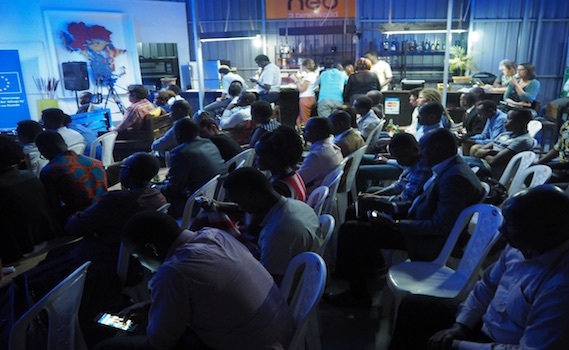 On June 28, the Delegation of the European Union to Rwanda together with Impact Hub Kigali hosted another edition of their Public Discussion Series about the “Media and elections – lessons from the Kenyan experience“. In advance of the upcoming elections in Rwanda on August 4 and Kenya on August 8, the Delegation of the European Union to Rwanda invited the public to discuss the role of media and to compare Rwandan and Kenyan perspectives. Ambassador Michael Ryan engaged the panelists Dr. Haron Mwangi, former CEO of Media Council of Kenya and Edmund Kagire, a commissioner from the Rwanda Media Commission and other players in the industry in a lively discussion. Among the key topics were the responsibilities of journalists, the media’s role in civic education, the importance of freedom of expression and the role of social media in the upcoming election process. In their opening statements both panelists reﬂected on the role of the media in past elections in their respective countries. Dr. Haron Mwangi recalled that following widespread unrest during 2007 elections, the Media Council of Kenya introduced trainings on responsible, unbiased coverage which contributed to the peaceful elections of 2013. The audience and panelists discussed what responsible journalism looks like. There was a consensus that unbiased, fair and impartial coverage is essential for journalistic integrity. The audience seemed to agree that journalists have an important role to play in civic education and protecting the rights of voters through educating and informing the population about the election process. Throughout the discussion it became clear that it is not always easy for media to walk the line between free expression and keeping a peaceful atmosphere. The Kenyan history and commercialization of media served as examples to advocate for the regulation of media. However, many voices also warned against media censorship and intimidation of the press. Dr. Haron Mwangi called upon journalists to take the duty towards their countries seriously. He cautioned them to be aware of whose interests and agendas they are serving and stressed the importance of transparency as ﬁnancial and personal interests can hinder high quality journalism. Discussants pointed out the speed of information and opinions sharing which make the online channels very difﬁcult to control. Overall the emergence of social media seemed to be seen as part of the positive progress in the media landscape in both countries that allows for a more balanced and differentiated coverage. Presidential Candidate Frank Habineza who was part of the audience compared the media environment in Rwanda of 2017 to 2010 and said he sees positive progress that he hopes will continue. The role of international press was part of the debate as well. The discussants expressed a wish to challenge the often perceived dichotomy between critical foreign press and self-censored local press and called for meaningful ways to cover the elections from their own Rwandan perspective. In preparation for the upcoming elections the Rwanda Media Commission is providing trainings for journalists on how to cover on elections responsibly and has come up with guidelines to guarantee objectivity. Additionally, a monitoring team will make sure the elections are covered in a more comprehensive, impartial manner. “I think we are going to see journalists doing things differently this year. The situation in Rwanda has changed hugely, space has opened for people to express themselves. This is a very interesting time for us and we are up for the challenge,” says Edmund Kagire. In his closing remarks Ambassador Michael Ryan said that there is still a way to go, but both countries have seen positive developments. He emphasized that the EU believes ﬁrmly that freedom of expression is essential for society and thanked all participants for an excellent discussion. He further mentioned that the Delegation of the European Union in Rwanda and diplomats of EU member states will be carrying out a Diplomatic Watch around the country during August’s elections.